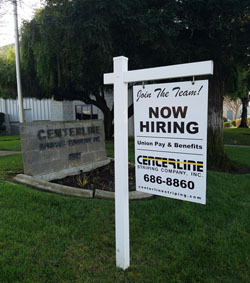 With the growth rate over the last few years throughout the central valley we are always looking for dependable, qualified applicants to join our workforce. If an opportunity like this appeals to you, fill out the following form and we can tell you what a career with Centerline Striping can offer you. Centerline Striping Co., Inc. is an equal opportunity employer. ©2018 Centerline Striping Co., Inc.